Everyone loves getting outside during the spring and summer months. We love to hit the swimming pool, the playground, and our back deck. There's usually a bit of lamentation as the warmer months come to an end as we feel it signifies the end of outdoor play. But it doesn't have the be that way! 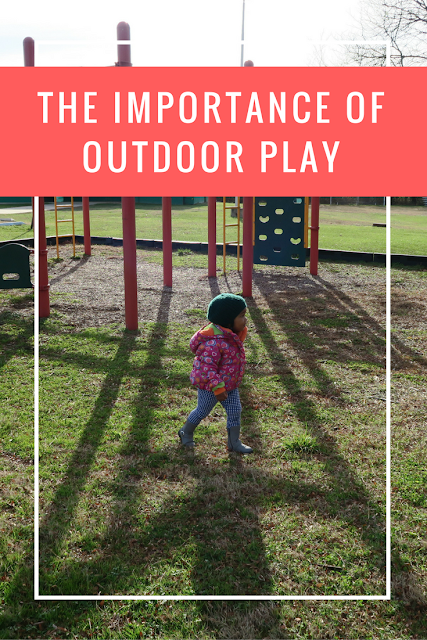 You can get outdoor play in all year round, and it's really important for kids to have that time outdoors. The International Play Equipment Manufacturers Association (IPEMA) is currently running a campaign called Voice of Play encouraging parents to get their kids outdoors for play all year round. They share the scientifically proven physical, social, emotional and cognitive benefits of play. In the fall there is fun with playing in the leaves. You can also still hit the playgrounds you frequent in the warmer months. In the winter there is fun times to be had with the snow. Cold weather doesn't mean you have to hibernate. Bundle up and get outdoors. With a very active toddler we'd lose our minds if we tried to stay inside all winter! And really it's important for both children and parents to spend time outdoors in play. This is our first fall/winter where BabyCakes is completely mobile. She loves crunching in the leaves and I'm looking forward to building snowmen and making snow angels when the snow begins to fall. Check out the Voice of Play website, Facebook, and Twitter for more encouragement to get outside for #YearRoundPlay. How are you enjoying outdoor play? This is such a great reminder. I strongly agree that going outside to play is soooo good for children - but when it gets cold, I am hesitant. Thank you for reminding me to get us outside!!! !